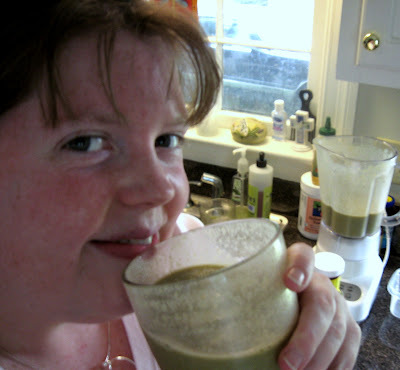 Day 4 of the Spring Green Smoothie Challenge! I have to say I'm proud of myself for sticking this out! We're halfway done! Tomorrow will be last full day of the cleanse and then I will take 3 days to slowly transition back to eating healthy meals. This has been a great challenge to me in so many ways! I'm proud of what I have learned during this process and I'm proud of myself for having the discipline to stick with this program. It is 9 days total from the first day of transition to the last. I slowly entered into the program and I will slowly transition back to whole, nourishing, gluten free, dairy free, and soy free foods! - I feel really healthy and I like that feeling!! - I am learning what it means to be a conscious eater -- a true accomplishment for this girl who will eat when stressed, bored, or ill-at-ease. - I have learned that I do not "need" a full course meal (especially for every meal) to make my tummy happy. - I am learning how to recognize when I want a type of food simply because I have fond memories for it, not because it is healthy or good for my body. - I am starting to enjoy exercising just for the sake of exercising, not necessarily to accomplish a forced goal! - I feel like smiling more often when my body feels well! - I have more confidence in myself and what I believe I can do! Tonight's smoothie is probably my absolute favorite so far in the program! On the way home I thought about the smoothie I would like to have for dinner. It's amazing the things your body will crave during programs like this ;-) ... do you know what I wanted all day today? A peanut butter and jelly sandwich. Heavy on the peanut butter, light on the jelly. How could I make a smoothie that *might* taste similar? My favorite jam is strawberry, so I knew strawberries would go in. And with strawberries... a banana always makes a happy companion! For the "peanut butter" part, I settled on almond butter since we are not eating peanuts during this cleanse to avoid mold. Here's my smoothie. Compared to other smoothies I have made so far, this one is very filling due to the high protein content of the almond butter. Feel free to adjust the amounts to suit your taste and calorie consumption! Add all to blender and pulse until smooth. Serve immediately Makes around 1.5 pints depending on how much liquid you add. This is one smoothie I'll definitely be making on a regular basis! 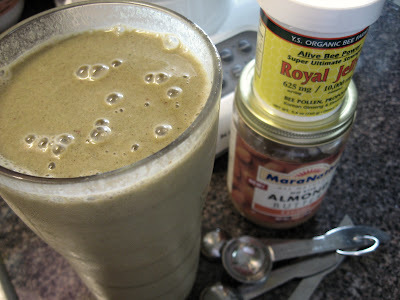 - I was surprised at how well the collards are blended into this smoothie! The primary flavors are a mixture of strawberry, banana, and almonds, even though there are substantial greens! It was a nice break in the routine of very, very green smoothies! - I loved added the bee pollen to this smoothie because it reminded me even more of peanut butter and jelly, or honey in this case! It's very healthy and a great source of natural sweetness! - I bough very very ripe bananas at the grocery store today. I find that overripe bananas are wonderful in smoothies because of the serious natural sweetness! The lady in line behind me asked why in the world I would buy such ripe bananas! I told her that I peeled them, froze them, and added them to smoothies. She was genuinely delighted. She smiled and said, "Wow, I never would have thought to do that. What a smart shopper you are!" It made my day! Carrie- I are doing so amazingly well on this program. I am so impressed and so excited by that! If there were a Green Smoothie Cleanse Award it would be yours... wait. Hmmmm. Maybe there should be. Meghan -- thank you SO much!!! I have truly enjoyed the challenge of this cleanse! I will definitely walk away from this program a healthier, happier person, and I will use a lot of the principals you taught even after the cleanse is over. You can bet we'll be eating a lot more vegetarian and raw meals from here on out! I still love meat, but we will eat it less frequently and I will look forward to using fresh vegetables more often in my kitchen!! Many thanks dear friend! It is funny what your body craves. On Sunday night I just wanted to bite into an apple. Last night I was thinking about a sandwich I made almost a year ago (a recipe from Vegetarian Times). Well done! You're a superstar for doing the cleanse, starting early and documenting so well. Reading this makes me wish I'd done the cleanse, but I will likely incorporate some of those smoothies into my diet. Might even do the cleanse some other time. Now that I'm reading this I sort of wish I HAD done the cleanse. I chose to do it out of lack of convenience. I could have pre-blended my breakfast and lunch for the day but didn't want the smoothies to to lose nutrients. I'm noting these recipes, though, and will incorporate them into my life. Might even do the cleanse myself some other time. You are a superstar for doing this and documenting it so well.